The archer’s paradox is a physical phenomenon which occurs when an arrow is shot past a bow. It is explained by the flexibility of the arrow shaft. Traditional bows such as the English longbow or the Hungarian riding bow have no arrow rest. This means that although the bowstring is positioned in the middle of the bow, the arrow has to be shot either from the left or from the right side (left side for right-handed archers with Mediterranean grip). In other words, the arrow never points directly towards the target, but is slightly off-center. 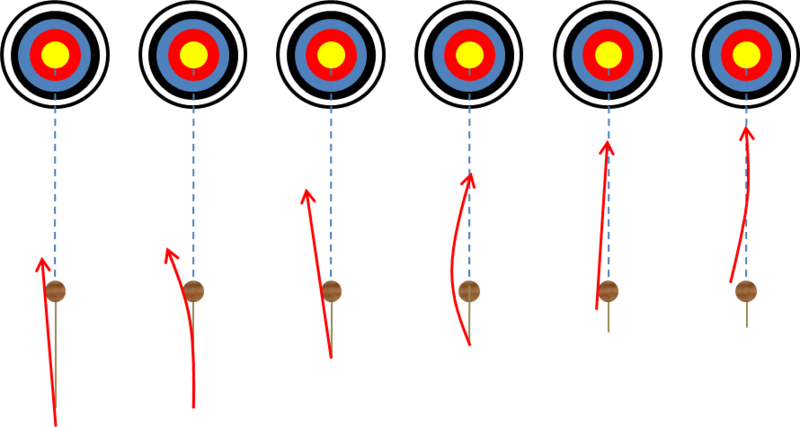 Nevertheless, the arrow flies true and in some cases even overcompensates and hit the target on the other side of the “center” (See figure). The bow limbs straighten and pull the string back towards it resting state at the brace height. The direction of this force is towards the target. The accelerating arrow pushes against the bow (and the bow pushes against the arrow, according to Newton’s Third Law). The direction of this force is mostly lateral, to the side of the bow. In the initial phase, just after the release, the bowstring starts to move back towards the bow. At the same time, the arrowhead remains stationary in accordance with Newton’s First Law. This causes the arrow to be compressed between the arrowhead and the bowstring, using the bow itself as a fulcrum. The compressed arrow then seeks to return to its resting state of not being compressed and straightens while being moved forward by the bowstring. The state in the third phase is exaggerated and is only assumed for an instant. The pendulum effect then swings the arrow in the opposite direction while the bowstring keeps pushing it towards the target. This causes the arrow to flex “around” the bow and lose contact with it. The arrow then oscillates along its flight path, eventually hitting the target farther to the opposite side of the bow. The flexing and oscillation of the arrow is beautifully illustrated in this video by Daniel Yononindo.